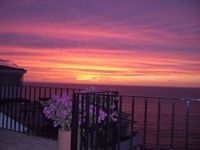 As I’m writing this, I’m sitting on the roof deck of my friend Chris’ mother’s house in Puerto Vallarta, Mexico. I’m five stories above the Pacific Ocean, but because of the way the sound collects on the concrete structures below and around her house, the acoustics of the crashing waves are actually amplified, making it sound louder than if I were sitting on the beach ten feet from the break. The house is wired throughout, and I’ve got some Tito Puente playing on my iPod through the stereo three stories below, which of course fires out the tiki bar speakers on the roof. Now, as the sun prepares to set midway through my first vacation in about three years, I was struck by an insatiable urge to whip out the ole’ laptop and update my blog for the first time in a long while. Isn’t technology great? In fact, it so happens that technology is going to be the focus of this post. I recently finished Doris Kearns Goodwin’s biography of Abe Lincoln Team of Rivals (which is a truly amazing book and deserves a blog post of its own), and when I closed out the last page, I found myself so emotionally impacted by the amazing character and character-based accomplishments of this man that I needed something very different for a next book. So, I grabbed a Christmas present from my Mom and Dad, Ray Kurzweil’s The Singularity is Near. And different is what I got. For people who are not familiar with Ray Kurzweil, it’s worth pointing out up-front that he is one of the most peer-respected inventors, thinkers and futurists around today, with, as his bio points out, “a twenty year track record of accurate predictions,” largely rooted in the future of technology. PBS named him one of “16 revolutionaries that made America”, along with other inventors over the past two centuries. He is the recipient of 13 honorary doctorates, as well as the Lemelson-MIT prize, which is apparently the world’s most prestigious prize for innovation. In short, the guy is no dummy. The Singularity is Near is in many ways a simple book with a simple premise; that people mistakenly view the future, and the future pace of change, with an inherently linear frame, and as such, most people on the planet are essentially oblivious to the fact that technological innovation and adoption progress exponentially (and in some cases with an exponential exponent). More importantly, few people have an accurate idea of just how vast the changes that are coming down the pipe are, and how soon these paradigm shifting technologies will be here. If you consider this statement – that we will have two hundred centuries (20,000 years) of progress, at the current rate of development, in the next 100 years – it’s totally understandable if you’re reaction is something along the lines of “No way. That’s impossible.” But closer analysis will help you understand how something like this could make sense. Most non-technophobes are familiar with Moore’s Law – an observation made by Gordon Moore , the founder of Intel, in the mid-1970’s that we double the number of transistors on an integrated circuit of the same size every 24 months. This has held true since then and is expected to hold true at least through 2020, and probably indefinitely beyond with the shift to three-dimensional molecular computing. What does this mean to those of us in the rest of the world, who use computers to send email and watch YouTube clips, and who are more familiar with Roger Moore than Gordon? It means that computer processing power doubles every 2 years. 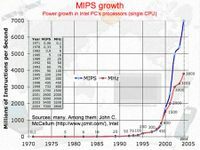 But what’s really interesting, and what helps make an outrageous statement like the one above make at least some rational sense is that processing power is not the only technological component subject to Moore’s Law-like exponential advances. The same is true microprocessor cost, RAM prices, magnetic storage capacity and many others. When you boil it all down and consider how advanced computing power already is, then subject it to the already proven continual exponential growth, it’s hard to argue with his conjecture that by mid-2020’s, every person on the planet will have the ability to buy a $1,000 computer with enough computational power to equal all cumulative human thought throughout history (nearly 10 billion people) in less than one thousandth of a second. It is in this light that I started to understand just how different the tools of tomorrow will be from the tools of today. But, this is still just the backdrop of the post – albeit a necessary backdrop in order to appreciate the legitimacy of Kurzweil’s main point and real subject of my post. Kurzweil’s central point is that as the computational power of available technology reaches that of the human brain, and then quickly surpasses it and all collective human brains, non-biological intelligence will become the driver of progress and will no longer be slowed down by human boundaries, thereby growing the exponent exponentially until all matter and energy near us in the universe is used for computation and the storage of information. If this last part sounds like a bit of a stretch, consider what happens as we pass the point where non-biological intelligence surpasses biological intelligence, which he refers to as “the singularity”. After this point, non-biological intelligence will be able to evolve itself drawing off of a combination of (i) its super-intelligence, (ii) instantaneous access via the Internet to all available human knowledge at all times, (iii) the fact that non-biological intelligence is much more efficient at transferring information from one node to another vs. human’s highly inefficient language-based sharing mechanisms and (iv) the fact that it doesn’t need coffee breaks or get tired. 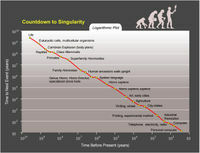 Oh yeah, and don’t forget that it will continue to get access to exponentially more computational power over time after the singularity, at the very least – a point that is almost certainly dramatically over conservative given the fact that the current exponential growth pace is based on non-superintelligent human progress. How realistic is this? Well, artificial intelligence (AI) systems are already in use today doing things like scheduling airline traffic, reviewing data from surveillance satellites, monitoring the stock markets for insider trading and other fraud, and aerospace engineers have even been using genetic algorithms (so-called because of their ability to actually evolve on their own) to design highly sophisticated equipment like new jet engines. In short, the integration of non-biological intelligence into society is already well underway. Before we get to the singularity though, the first step will be the integration of biological and non-biological intelligence, and this was actually much more interesting for me because as I thought about it, I was somewhat stunned to realize that I actually believed it was possible in the somewhat near-term given the exponential advance frame from above. Naturally, this is a highly controversial topic, and one that will undoubtedly be met with highly emotional responses – namely fear, disgust, disbelief and outright rejection. And understandably so, as this quickly becomes a religious question (readers of this blog will now finally understand why I choose this topic as the first thing to write about in so long). The integration of biological and non-biological intelligence has already begun with numerous experiments ranging from hybrid neural networks to devices aimed at replacing damaged areas of the brain causing diseases like Parkinson’s. But this is only the beginning. Kurzweil believes that by the 2040’s, we will have fully non-biological entities that we could upload new or existing human personalities to that will be able to easily pass the Turing test – essentially meaning that they will be conversationally utterly indistinguishable from biological humans. As far as I can tell, people will fall into two camps on this matter. People who are in any way religious or faith grounded (even so casually that they might frequently say that they are not religious at all), will find it very difficult to believe that this is possible. It just clashes too much with a traditional view of the human soul. In their minds, even if these non-biological entities are possible (a point they will certainly contest) and no matter how realistic, they will believe in their heart that these things will not truly behave like humans, and most importantly, they will not BE human. Purely rational atheists who view the human body as nothing more than a highly evolved machine, made up of nothing but chemical and electrical mysteries that are all ultimately solvable with the proper equipment and insight, will find themselves believing this to be possible. Perhaps they will be as shocked at themselves as I was as I thought about this, as viewing their own personalities in the frame of nothing more than an elaborately evolved collection of analog and digital, chemical and electrical processes can be a disconcerting thought experiment. If we can perfectly reverse engineer the brain (and if you fall in the purely rational camp, there seems to be no reason to believe that we will not be able to do so with the proper advances in technology – which seem to be right around the corner as per the above backdrop information), can we so easily say that a non-biological person would be any less “human?” Again, from a purely rational perspective, I think the answer has to be ‘no’. If the engineering is perfect and the non-biological brain functions exactly as the biological one, it would be hard to view this non-biological entity as casually as we view a toaster, for example. What would the creation of non-biological humans mean to modern monotheistic religions that are built around the central role of humanity in the universe and their interplay with a God? If people are just biological machines that can be perfectly replicated by other people, does this in any way damage God’s role in the universe or the legitimacy of His accomplishments? Or conversely, what could the failure to achieve something like this given adequate technology mean to atheists and their beliefs about the essentially random and ultimately irrelevant role of humans in the universe? While one could easily look at this impending success or failure point and think that it will represent an “answer” to some of the super-questions like ‘does God exist’, I’m sad (or happy – depending upon how you want to look at it) to say that I don’t think this will happen at all. Ultimately, I don’t see the results of advances in this technology, or any technology for that matter, shedding much light on these questions. It may shift the goal posts a bit, so to speak, but as has happened again and again throughout the progress of science, the more philosophical role of God should remain untouched. As I’ve mentioned in previous posts on topics like Intelligent Design, regardless of how much we learn about what the physical rules of the universe are and how things work the way they do, there is simply nothing that science can ever offer us about WHY the rules are as they are. Astrophysicists can tell you Einstein’s cosmological constant to fifteen decimal places and tell you what that means to the expansion of the universe, but they can’t tell you why it is what it is. 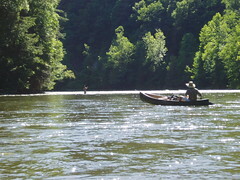 But long before we get to have that argument over campfires with our non-biological fishing buddies, however, there seem to be a lot of practical questions that need to be addressed as we head towards “the singularity.” As a soon-to-be parent and the husband of a teacher, it strikes me that we’ll likely need to give the entire education system a major upgrade, probably a lot sooner than people think. With so much of today’s education focused on the accumulation of a somewhat narrow base of knowledge across a wide array of subjects which will enable us to function productively in society, it seems that the focus of curricula will need to be adapted to make us more efficient and effective users of the tools that will be at our disposal. For example, I doubt it will it still make sense to spend months learning the key dates and names of the American civil war or the advance of the European explorers, when we will be able to download the entirety of this information into the non-biological component of our brains in a matter of minutes. Instead, it seems that the focus should be reoriented towards exercises that help future generations harness their creativity to better use the technology at their disposal. This creativity can be then be applied to subtopics like problem solving, the arts, interpersonal dynamics (conflict resolution, etc. ), critical analysis and design. Instead of learning about General George McClellan’s failed 1862 Peninsula Campaign, students might instead be asked WHY he failed against General Lee’s smaller army, and to design a tactical simulation that would have succeeded in accomplishing Lincoln’s goal at the time – namely, ending the civil war three years earlier than it ultimately did, and saving tens of thousands of American lives. I have to admit, taking all of the time in schools that is currently needed for data/background accumulation and transitioning it to guided critical analysis sounds pretty interesting to me and makes me somewhat jealous of our kids. What does this mean for real estate prices? Ultimately, regardless of whether or not these technological advances happen exactly according to Kurzweil’s aggressive timeframe, it does seem likely that we will experience his three revolutions (genetics, nanotechnology and robotics) during our lifetimes. While the scope of what we can expect in the future unfortunately takes the wind out of my sails a bit on my excitement over wifi networks and iPods overlooking the Pacific, it does open up a whole host of questions. And isn’t the inherently human characteristic of asking questions what life is all about? So, as I prepare to shut down my computer and go back to the task of staring at the ocean, I strangely find myself stuck wondering about what genetic and nanotechnology advances will mean to real estate prices in New York City. Assuming we can extend life essentially indefinitely through gene therapy and nanobot-based cellular repair, it seems that the population growth will skyrocket and real estate prices will continue their relentless ascent. Maybe buying a place in New York does make sense? Of course, after the singularity it sounds like we will all be living in virtual Victorian mansions inside our $1,000 laptop supercomputers, which does make a $2 million studio apartment seem a bit unnecessary. Oh well, I guess we’ll just have to let it play out. And anyway, it’s time to change the Tito. I was forwarded an interesting link today to a short streaming segment offering a view on the trajectory of current trends in technology and media. As a generally early adopter and middle of the road tech geek, I like some of the thoughts here, but it brings up a fundamental problem that I have with some of the underlying theory behind the blogging revolution - perceived by some to be on the road to total takeover of broadcast-style media. As a blogger, it's clear that I am a fan of some aspects of the technology. However, I don't believe in the all-out revolution theory because I think the "psychology of simultaneity" (an important and almost always overlooked piece of the equation) outranks the individual benefits of customization, at least when it comes to mainstream entertainment and news. Personalized media has been something that I've been fascinated by for quite some time. Most of my friends will remember the company I started in 2001 to look at the opportunity to create non-linear television programming using cable video-on-demand and personal video recorder technology entering the marketplace at that time. Ultimately, we were a bit early to the opportunity, and decided not to commit production money at the time, but I'm still a strong believer in the power of the concept. The difference, however, with that implementation and the customized experience projected as part of the future vision offered above, is this idea of simultaneity. What do I mean by simultaneity, and why do I think its so important? I think that a large part of the reason that shows and movies become social phenomenons is that people really don't want to miss what other people are seeing, and there's a certain unspoken comfort that comes along with watching something that you know a lot of other people are watching. This still holds true in the age of Tivo. I still talk about all of my favorite shows with my friends, we just don't talk about them 10 minutes after they aired on television. We talk about them a week later, when we know that everyone has now had time to watch their recorded episodes. I believe (and could certainly be wrong) that if you take out this experience of simultaneity (or now semi-simultaneity) you remove a big piece of the enjoyment that this entertainment offers its viewers. Largely because of my beliefs about the power of simultaneity, I don't think we'll ever see a day, like the one projected in that "Museum of Media History" segment, where everyone gets their own customized news, etc. Just because technology allows something doesn't mean that the hard social wiring of the human race are going to demand and adopt it. This point extends down from mainstream media and news, into the blogs themselves, and the long-range potential of blogging. And on this point, my guess is that the majority of people will end up being a lot like me - there will be some fascination with the idea of creating a historical record of your own thoughts (with little real care for whether or not people read it, other than a desire to create debate), but that mainstream credentialed media will always be the place I turn for trusted news that I know other people are reading as well. Nicely produced, but not very compelling. "Googlezon"? "Friendsterbot"? C'mon folks. Not too imaginative. Using the pi symbol in the Epic shadow was, however, very clever. I thought it was a bit too long to leave the message about media commercialism/vacuousness until the end. I always get the feeling with these kinds of things that the creators think they're onto something new, which makes the fictional Museum of Media History all the more ironic. Similar techno-optimism and dystopian projections have accompanied the introduction (and commercialization) of every new communication technology (the stuff people were publishing about the telephone is particularly hysterical). But, I have to say, I enjoyed it; though I wonder how it would play without the foreboding sentimental tunes. This blog post is really just a test of the Flickr software.